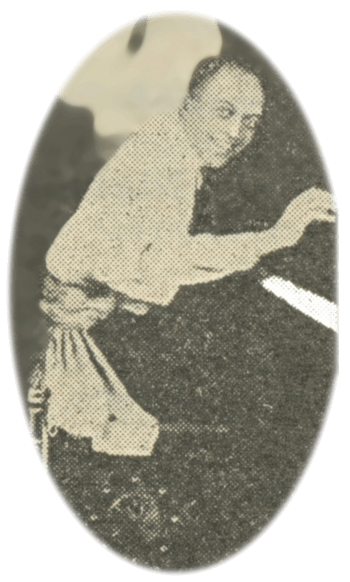 Charles A. Matson - the "little Clarence Williams" had been active in New York of the 1920s as a pianist, recording musician and booking director. From Delevan, Wis., to Broadway. From the side of the barber shop chair In his father's barber shop whom he learned the barber trade, to Broadway.. as booking agent, production manager and musician of first rank. These extremes mark the course of Chas. A.. Matson with offices in the Gaiety Theatre building. New York City. Matson was born in Wisconsin of sturdy Western parents. Graduating from public school. 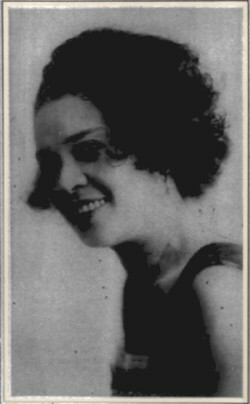 in 1910. with rinse honors, later attending Wisconsin university and the Chicago College of Music. From the Mart of his career persistency predominated. Matson must succeed In manic. He loved it. Playing in a known big musical organization was a big goal for a youngster just out of school. But it Just had to be. So Matson tackled his first big job as member of Elgars's famous Chicago band. For four years his piano playing and musical arrangements helped bring popularity and succeed to that organization. But a bigger field called the young dreamer. New York loomed as the mecca, tor the game Wisconsin aspirant. He could lead orchestras, write music, book shows and manage theatrical I outfits now. So why stay west? 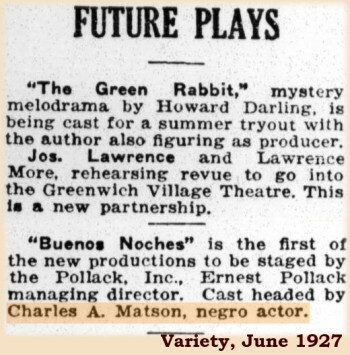 To-day Matson´s name on Broadway is associated with successful revues and prominent bands. Among the later being Chick Webs. Arthur Gibbs and Buddy Fowler. Matson Is well educated, a fluent speaker. possesses business-like appearance always, and represents the class of business men, the present day demands. He ls a credit to his lofty profession and the proud parents back home both of whom are living and proud of baby boy, who stepped from the barber shop to prominence in world's largest city. Maybe some more sessions by Mamie Smith with Charles Matson piano. 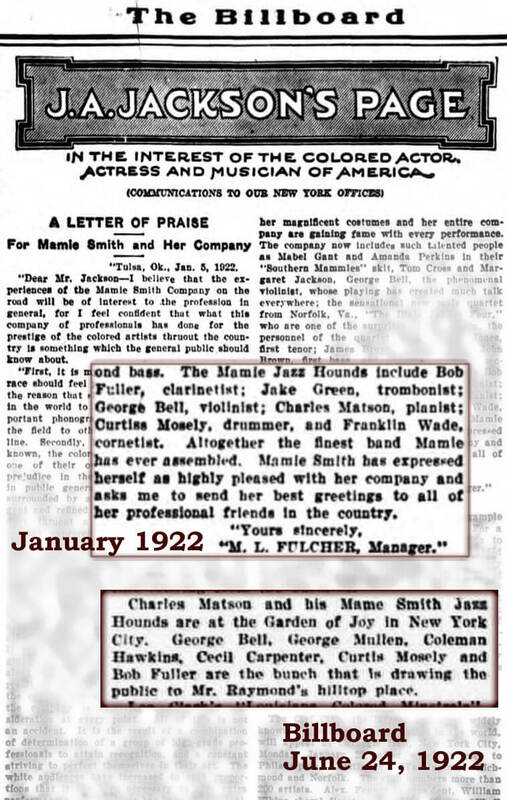 In December 1921/January 1922 blues singer Mamie Smith went on a vaudeville tour. Charles Matson put together the touring band. As the musicians are given in some newspaper articles, the personnel for the May 1922 and June 1922 recording session is relatively secured. 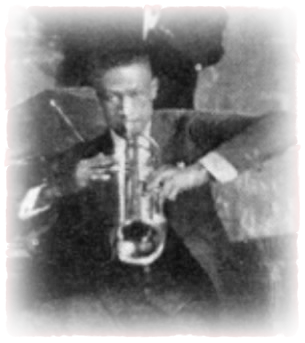 While the tour, a very young Coleman Hawkins joined the band. As Matson had been the bandleader, it may possible, that he “discovered” Hawkins. 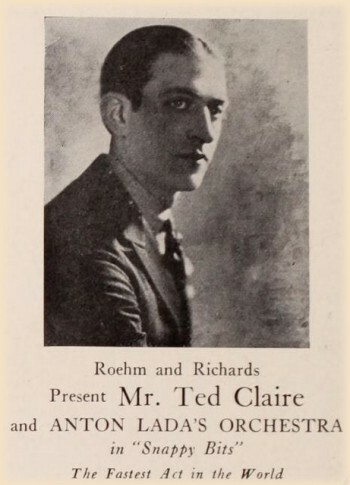 Ted Claire was a white vaudeville act by his own. In late 1922 Ted Claire appeared with a new revue: Snappy Bits. 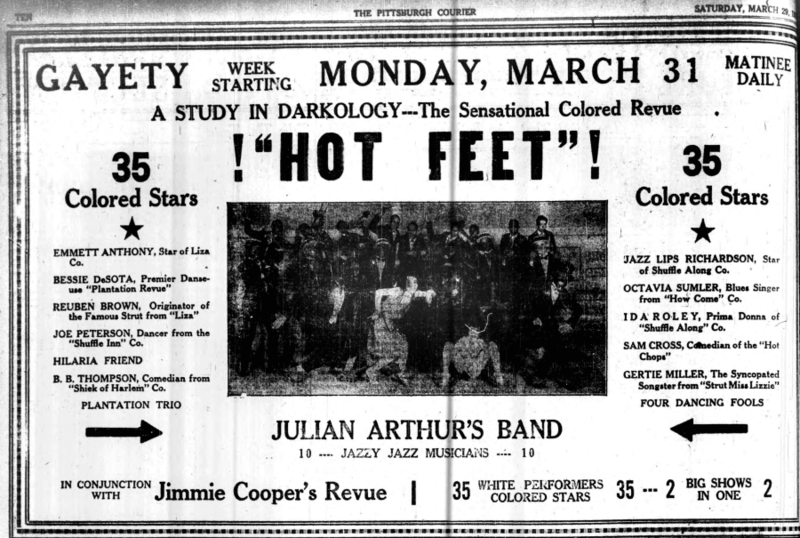 Although a white vaudeville act, it seems he had been backed by a band of afro Americans. In the Gennett catalogue a photo of the band appeared – directed by Chas. A. Watson (sic). This is also the only knewn picture of Charles Matson(so far…). 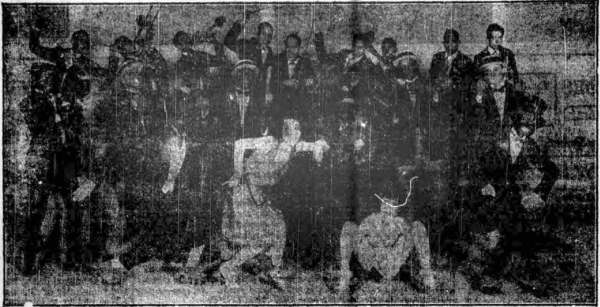 According to some clippings, Matson played with his band till early 1923 at the “Garden of Joy”, so this is potentially his working orchestra. There may be some similarities in the personnel to the sessions waxed with Mamie Smith. One of the names mentioned sometimes for the trumpet chair, is Johnny Dunn – but this is unlikely. Drummer may be Curtis Moseley. Towards some other discography’s a violin is clearly audible in harmony with the clarinet. George Bell or Leroy Parker? Cornet maybe by Thomas E. “Petey” Hillery, who recorded with the Creole Serenaders. 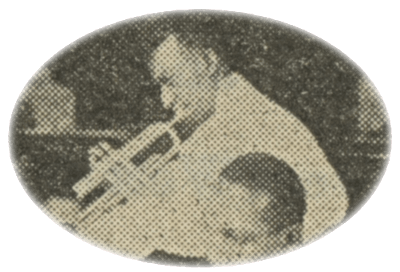 Shortly after the recording session Ted Claire had been backed on stage by the orchestra of Anton Lada, of earlier fame with his Louisiana Five. 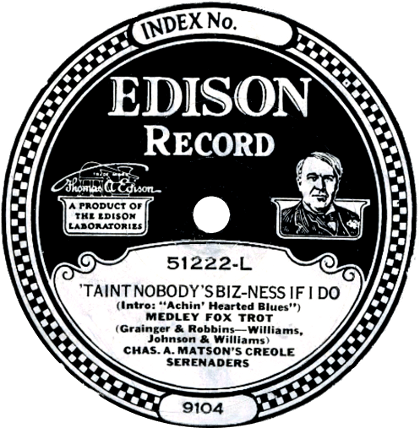 This session for Edison had troubled collectors for a long time. Freddie Keppard had been suggested for trumpet (cornet) or Lorenzo Tio (also from New Orleans) as the clarinetist. Some believed, this is in fact “Piron´s New Orleans Orchestra” playing and recording at the time in New York. None of these...! In spring and summer 1923, singer Daisy Martin had been backed on stage by “Chas. Matson´s Serenaders”, and – we have a collective personnel! With the first (April 1923) - Irving Benford must be clearly a "misspelling" of William Benford. The second clipping is given the name correct as William Benford. The same with "Irving Arthur" = Julian Arthur. Ok - Arthur had been a violinist - but... May it possible, that he also played one of the saxes? That hadn´t been that uncommon in these days... Also: Leroy Parker as well as Julian Arthur had been violinist – But, even for a “Serenaders Jazz Band” of this time, it is unlikely, that they had TWO violins in the band. So, I think, one played the saxophone. Julian Arthur later replaced Matson as the Bandleader with the Jimmy Cooper’s Revue. Also given - with the second clipping, "Snow Fis(h)er. There had been a “Snow Fisher” (trumpet) with the band of Noble Sissle in Paris 1929, but also a drummer and dancer of the same name in the USA and Paris around this time…I think he is the dancer Fisher and has nothing in common with the band. William ‘Splif’ Escoffery (bj) was a school day friend of Duke Ellington in Washington DC. 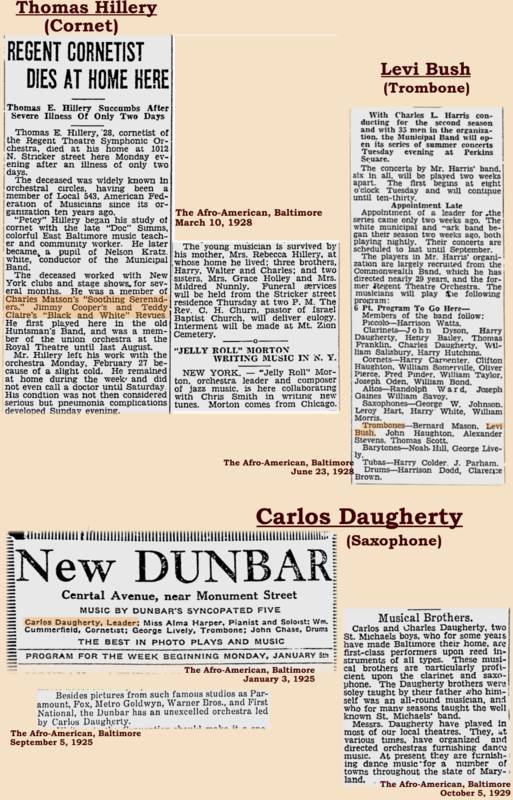 He also played, around 1917, in one of the earliest bands of Ellington. 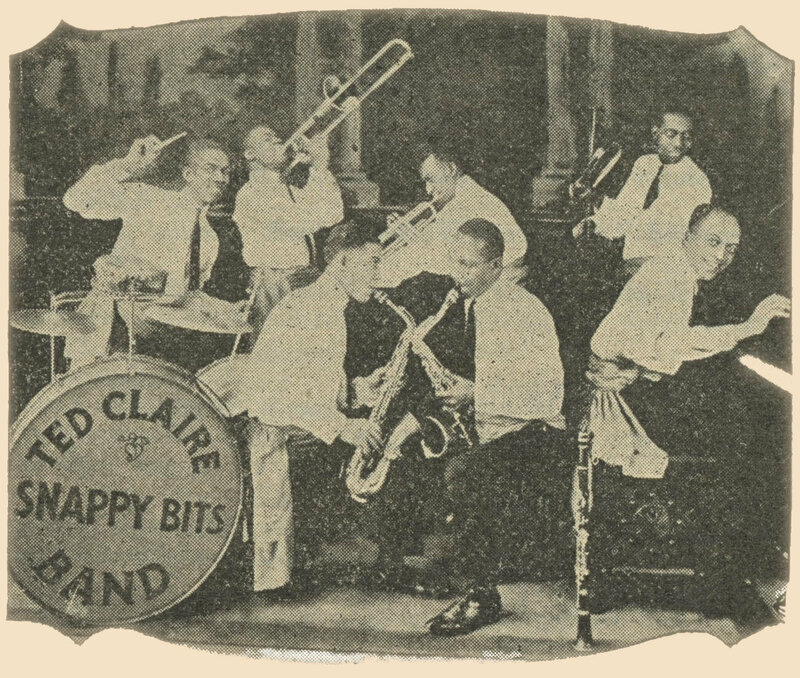 Afterwards Escoffery was the banjoist with the June Clark band in 1925 and recorded with the Gulf Coast Seven, and with some other Perry Bradford sessions. William Benford (tuba) is the well-known tuba player, brother of Tommy Benford. He was born 1902 in Charleston, West Virginia. Benford was the brother of drummer Tommy Benford. 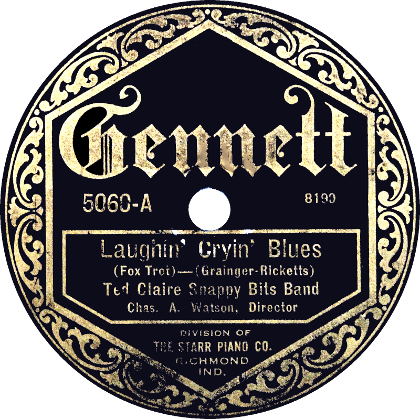 He, like his brother, was a member of the Jenkins Orphanage band in South Carolina as a child, touring with the band in 1915 in the United States and Europe. Benford died in 1994. Chas. O. Moseley (cl/sax) may be a relative of Curtis Moseley (or not...). At least Matson copyrighted a composition together with a C.O. Moseley in September 1923. Nothing more is known about him. Curtis Moseley (drums) - most likely nothing in common with the drummer Curtis Mosby from Californian fame. Moseley may have been born at Decatur, Morgan County, Alabama in April 1891 and died on 23 January 1928. Thomas E. “Petey” Hillery (Cornet) died in 1928 with the age of 28 in Baltimore. He also had been born in Baltimore. 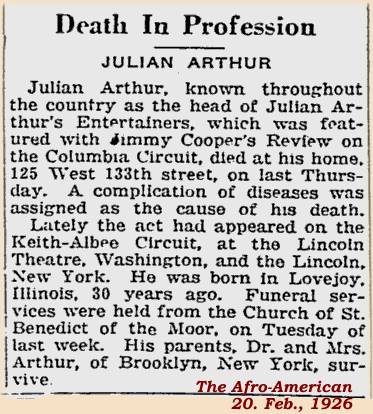 Julian Arthur (vln or sax), born 1896 in Lovejoy/ Illinois died 1926 in New York. I don´t hear a violin with “`Taint Nobodys Business If I Do”, but – with some passage on “I Just Want A Daddy” there may be a violin in unison with the clarinet/saxophone. Other opinions are welcome! 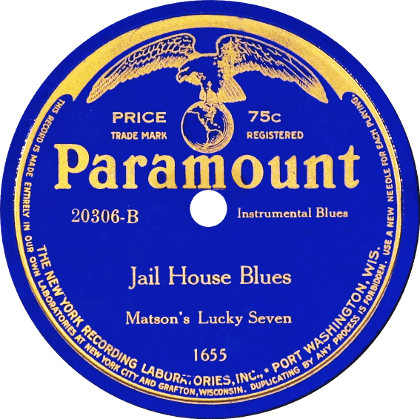 Although the personnel for Matsons last band side, MATSON´S LUCKY SEVEN, is only from comparison with other sides by the participated musicans, it is very likely. This applies also for Matsons accompaniment of blues singers of the day. 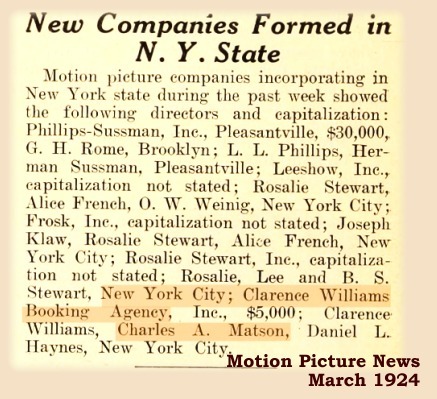 After 1924 Charles Matson shifted more and more to the business as an booking manager. There may be some other recording sessions (after 1924) with his participation, but this is unknown. 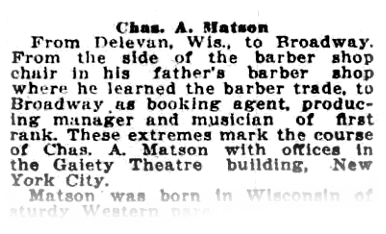 As we learned from the article above, Charles A. Matson had been born on January 29, 1892 in Delevan, Wisconsin. The “A” in the middle of his name is ,most probably from his father Alfred Matson, born 1850 or 1852 in Kentucky. His Mother, Lettitia Matson, had been born 1861 in Tennessee. He was the second of four children. His parents had been born in slavery. The work in his father’s barbershop couldn´t last for long - Graduating from public school in 1910 he first studied at the Wisconsin university and afterwards at the Chicago College of Music. With the band of Charlie (Charles) Elgar, he got in Chicago his first, longer lasting job as a musician and arranger for the orchestra. Elgar had been back in Chicago around 1913. According to Matson´s own words he worked with the band of Charlie Elgar for about four years. 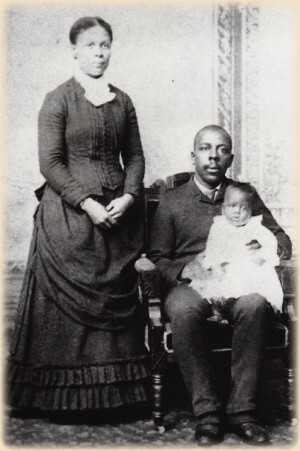 With his wife Ruthena (or Ruth G.) Matson, 2 years younger, born in Iowa, he had a little boy - Chas. A. Matson, Jr. born 14 Nov 1916. Ruthena & Charles Matson got married August 10, 1915 in Chicago. The only child of both died, just one and a half year old, on March 2, 1918 in Chicago. According to his Draft card (below) his son was 7 months old, when Matson filled the registration. That lead to a date of registration around May/June 1917. 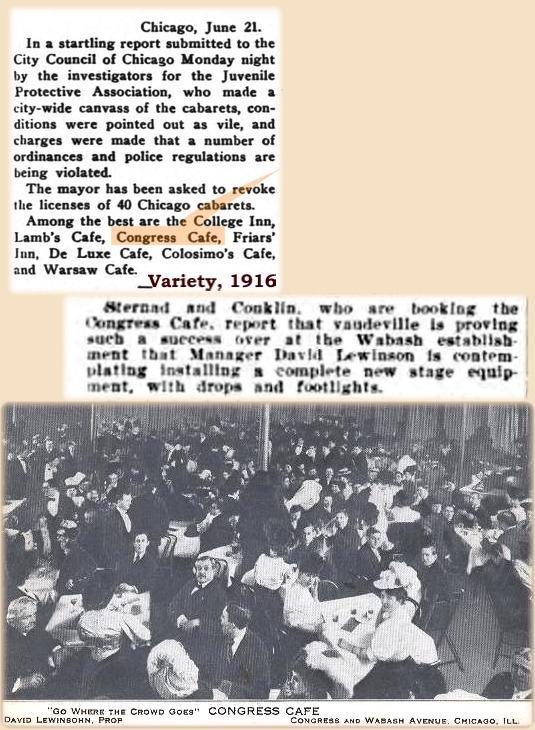 At this time he had quit with the orchestra of Charles Elgar, his last known employer in Chicago (according to his Draft Card) was a certain David Lewinson with the “Congress Café” at South Wabash Av. In early 1923 he and his band (formerly with Mamie Smith) left the “Garden of Joy” in New York. From now on, he became more and more a business and production manager . In early 1924 he was with the publishing house of Clarence Williams in NY, summer 1924 brought his own publishing Co. and orchestra booking agency at 1547 Broadway. 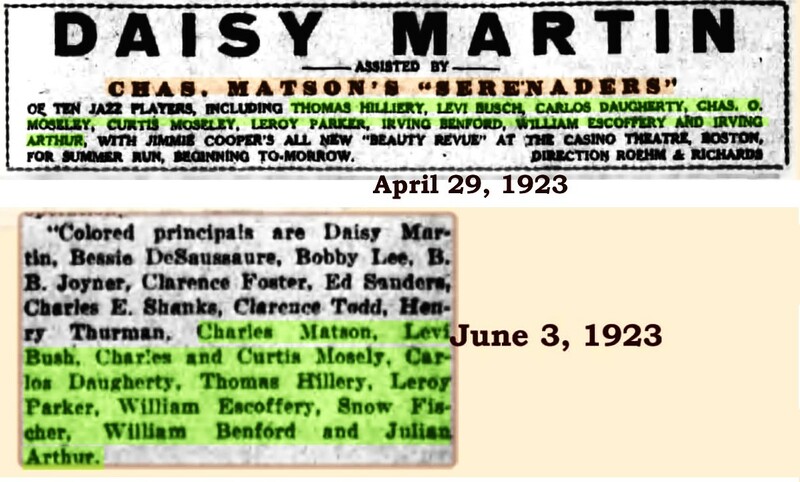 In January 1925 he led a band (Charles A. Matson´s Criterion Orchestra) at the Dreamland Ballroom in NY. With the band was Rudy Jackson (clarinet & saxophone) from Chicago. Also in 1925 he became manager of the Billy Fowler orchestra at the Club Alabam. Also around this time he managed the band of trumpet player Walter (E.) Young from Chicago (“Young´s Versatile Orchestra). 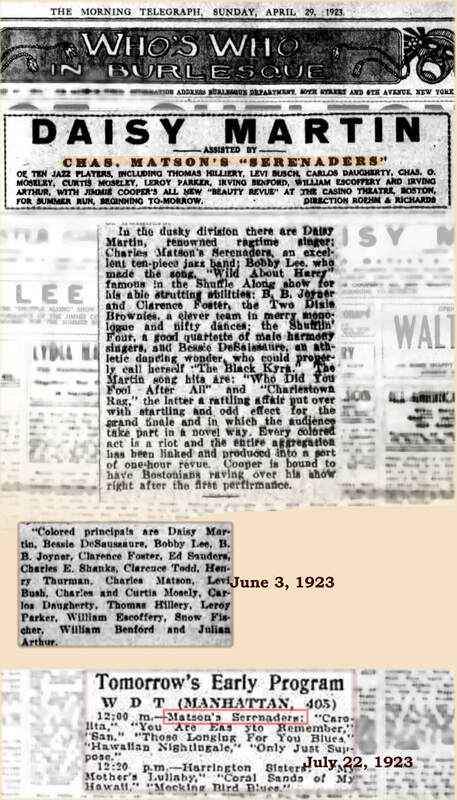 In 1926 and 1927 banjoist Buddy Christian (recordings with Clarence Williams Blue Five) played with the Matson Orchestra at the “Dreamland”, West 125th street, New York. Besides the Fowler orchestra, Matson managed in 1927 also the bands of (young) Chick Webb and Arthur Gibbs. On March 1927 opened the “Sewanee Club Revue” in New York, Matson had been the director. 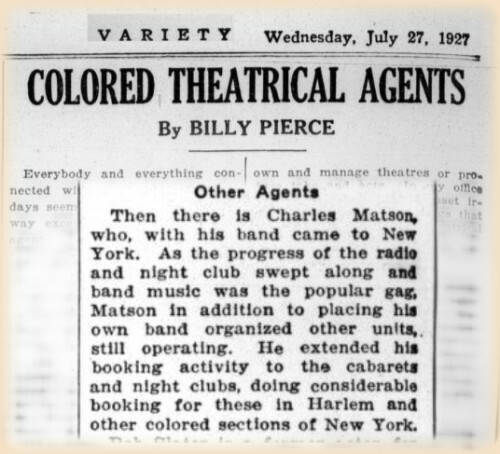 Charles was in the mid 1930s a secretary of the New York Musical Union. Ruthena Matson continued her career as a singer and dancer with Broadway productions (in 1935 she also appeared in London) till the early 1950s. The last trace I found of Chas. 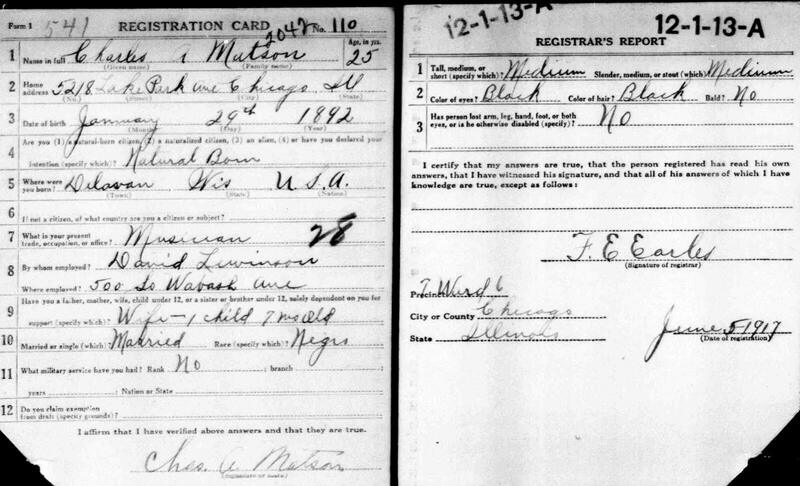 A. Matson is the 1940 (April 11) census. 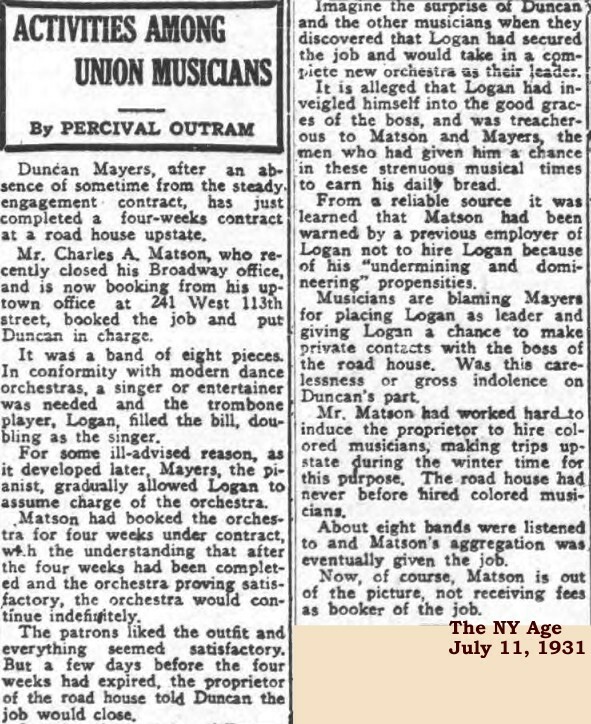 Still living in NY, Charles Matson (musician/orchestra) and his wife (musician/singer/theatre) are now lodgers by themselves. His wife died on December 1, 1976. Nothing is known to me about Charles Matson after the 1940s census. According to one (unverified) source, he died in 1974.